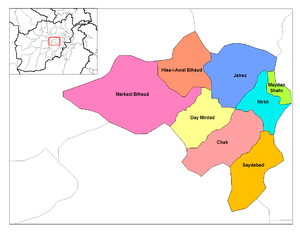 Maidan Wardak Province (also spelled Maidan Wardag, or Maidan Vardak, Pashto: میدان وردګ‎ Persian: میدان وردک‎, [Maidan warˈdak]) is one of thirty four provinces of Afghanistan. It is in the central east part of Afghanistan. About 540,100 people live in the province. The capital is Maidan Shar.